Our 2017/2018 Annual Review Podcast provides a recap on another fantastic year in the world of Forever Manchester, where we have helped bring happiness to over 100,000 Greater Mancunians. Throughout the year hundreds of individuals and businesses have helped to raise money for Forever Manchester, and we are delighted to announce that as a result of all that belief, commitment and effort, we have been able to give out more than £1.5m in funding, together with hundreds of hours of advice and support to help over 1,000 grassroots community projects and bringing benefit to more than 100,000 people. We like to say a huge thanks to everyone who has helped us, proving that even small amounts of money can make a massive difference. The effort and energy people put in to fundraising efforts is very much appreciated by everyone at Forever Manchester. Check out some of the amazing groups that we have helped fund and support. So if you have made a donation, took part in Captain Manchester’s Magical Tombola, baked a cake, cycled, bought some Forever Manchester merchandise, dressed up, dress down, kicked a football, fell out of a plane or attended one of many Forever Manchester activities during the year, we would like to say Cheers, Nice One and thanks a lot. Your help is very much appreciated and we hope you enjoy listening to this review of 2017/18, hosted by Terry Snowden and Jen Edmondson which kicks off in early 2017 and concludes with our Annual Birthday Party in February 2018. Some of the wonderful fundraising events throughout the year including Captain Manchester’s Magical Tombola, Forever Manchester Women events, the celebrity extravaganza that is the Mirror Ball, Running, cycling and Boxing Challenges, FM Week, Caketober and Music, Comedy and Poetry Nights. Details on the various types of funding we have provided to over a 1,000 community groups. 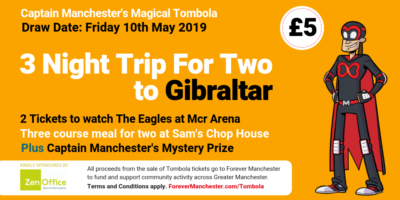 Lots of mentions of the growing number of Businesses Partners and Ambassadors who are continuously doing their bit to help raise money for and raise the profile of Forever Manchester. How our summer Great Get Together and Christmas Get Together community initiatives brought miles of smiles to people right across Greater Manchester. How Tony Walsh’s This Is The Place Poem inspired people who cared enough to act. We round off the annual review with some of the highlights from our incredible Annual Birthday Party, held at The Midland Hotel on 9th February 2018. Raising around £70,000, the party brought together a wide variety of community groups and local businesses. These highlights end with a speech from Nick Massey Forever Manchester CEO at the Birthday Party, who reminded everyone why we do it and why it matters.